Luo Ping. Landscapes, Flowers and Birds: Narcissus, 1780. Ink on paper. Freer Gallery of Art, Washington, DC. Google Art Project. Web. 8 August, 2013. Ullulaq, Judas. 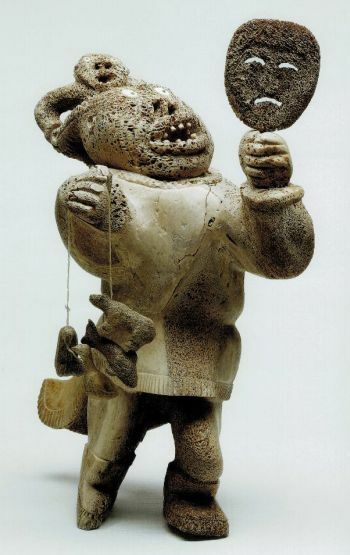 Shaman with Amulets and Ceremonial Mask. 1985. Whale bone, antler, stone, sinew. Private collection. From: McMaster, Gerald, editor. Inuit Modern: The Samuel and Esther Sarick Collection. Toronto: Art Gallery of Ontario, 2011. 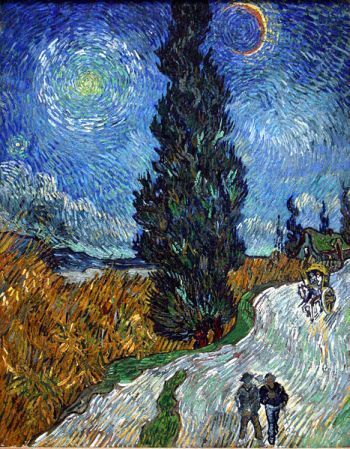 Gogh, Vincent van. Saint-Rémy - Road with Cypress and Star. 1890. Oil on canvas. Kröller-Müller Museum, Otterlo, Netherlands. "Vincent Van Gogh." Wikipedia, the Free Encyclopedia. Wikimedia Foundation 1 August 2013. Web. 15 August 2013. Getty. "Dorothea Lange's Documentary Photographs." (Excerpts from Dorothea Lange: Under the Trees and Dorothea Lange: The Closer for Me, 1965, courtesy Thirteen/WNET New York.) J. Paul Getty Museum. Web. August 15 2013. The primary purpose of citing references is to help the reader find the original source. When creating an entry for the works cited list using MLA format, the name listed first in the entry should be the contributor whose work is most relevant to the research being done. For example, if a person is studying plot devices in graphic novels, and they refer to a work with both a writer and an artist listed, the writer of a graphic novel should be the main focus of the entry. If the person is reporting on illustration techniques, the artist should be the focus. Lastname, Firstname. Title of Work. Year. Medium. Institution housing work, Location of Institution. Michelangelo. Moses. 1515. Marble. San Pietro in Vincoli, Rome. Rembrandt Harmensz van Rijn. Aristotle with a Bust of Homer. 1653. Oil on canvas. Metropolitan Museum of Art, New York. Seurat, Georges. Man Leaning on a Fence. 1880-81? Graphite on paper. Collection of Andre Bromberg, n.p. Lastname, Firstname. Title of Work.Year. Medium. Institution housing work: Location of Institution. Print publication information. Eakins, Thomas. Spinning. 1881. Private collection. Thomas Eakins. Ed. Darrel Sewell. Philadelphia Museum of Art in assn. with Yale UP, 2001. Plate 91. Print. Moholy-Nagy, László. Photogram. N.d. Museum of Modern Art, New York. The Contest of Meaning: Critical Histories of Photography. Ed. Richard Bolton. Cambridge: MIT P, 1989. 94. Print. Lastname, Firstname. Title of Work.Year. Medium. Institution housing work: Location of Institution. Print publication information. Database name. Web. Date of retrieval. Dali, Salvador. Crucifixion (Corpus Hypercubicus). 1954. Oil on canvas. The Metropolitain Museum of Art, New York. "The Grand Master of Surrealism Salvador Dalí." USA Today Magazine 25 May 2005: 34-41. Academic Search Complete. EBSCO. Web. 10 Feb. 2011. Giraud, Jean. Arzach. 2000. Ink on paper. Private collection. Riou, Frédéric. "Miyazaki & Mœbius: univers croisés." Cimaise 52 2005: 30-1. Art Full Text. Web. 10 Feb. 2011. Lastname, Firstname. Title of Work. Year. Medium. Institution housing work: Location of Institution. Website name. Website sponsor. Web. Date of retrieval. Blake, William. The Ghost of a Flea. 1918. Tempera heightened with gold on mahogany. Tate Britain, London. Art Project. Google. Web. 15 Feb. 2011. Mondrian, Piet. Composition II in Red, Blue, and Yellow. 1930. Oil on canvas. Private collection. Go Geometry. Blogger. Web. 15 Feb. 2011. Lastname, Firstname. Title of Work. Year of completion. Medium. Institution housing work: Location of Institution. “Article title.” Wikipedia, The Free Encyclopedia. Wikimedia Foundation Date of last update. Web. Date of retrieval. Burne-Jones, Edward. David’s Charge to Solomon. 1882. Stained glass. Trinity Church, Boston. “Edward Burne-Jones.” Wikipedia, The Free Encyclopedia. Wikimedia Foundation 15 Feb. 2011. Web. 15 Feb. 2011. Klee, Paul. Tale à la Hoffmann. 1921. Watercolor, ink, and pencil on paper. Metropolitan Museum of Art, New York. “Paul Klee.” Wikipedia, The Free Encyclopedia. Wikimedia Foundation 7 Feb. 2011. Web. 10 Feb. 2011. Lastname, Firstname. “Title of Work.” Year of completion. Website. Website Sponsor. Date of last update. Web. Date of retrieval. Carbajo, Víctor. “Cellule 50b dendrited.” 2010. Carbajo’s deviantART gallery. deviantART. 2010.Web. 15 Feb. 2011. Jevbratt, Lisa. Migrations. 2005. Migration (a map of the Internet). N.p. Jan. 2005. Web. 15 Feb. 2011. Lastname, Firstname. “Name of comic.” Comic Strip. Source of Comic. Date comic published. Print. Karasik, Paul. Cartoon. New Yorker14 Arp. 2008: 49. Print. Krahulik, Mike and Jerry Holkins. “Penny Arcade.” Web Comic. Penny-arcade.com 28 Jan. 2011. Web. 15 Feb. 2011. Trudeau, Garry. “Doonesbury.” Comic Strip. Star-Ledger [Newark] 4 May 2002: 26. Print. Lastname, Firstname, role. Title of work. Other contributors. Place of Publication: Publisher, Year. Print. O’Neill, Kevin, illus. The League of Extraordinary Gentlemen. Vol. 1, 1898. Alan Moore, writer. La Jolla: America’s Best Comics, 2000. Print. Pekar, Harvey, writer. The Quitter. Art by Dean Haspiel. Gray tones by Lee Loughridge. Letters by Pat Brosseau. New York: Vertigo-DC Comics, 2005. Print. Title of Work. Contributors. Production Studio, Year. Film. Chaplin, Charles, dir. Modern Times. Perf. Chaplain and Paulette Goddard. United Artists, 1936. Film. Like Water for Chocolate [como agua para chocolate]. Screenplay by Laura Esquivel. Dir. Alfonso Arau. Perf. Lumi Cavazos, Marco Lombardi, and Regina Torne. Miramax, 1993. Film. Mifune, Toshiro, perf. Rashomon. Dir. Akira Kurosawa. 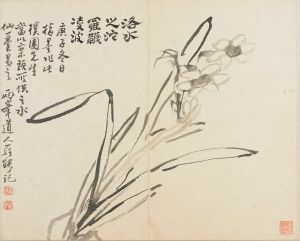 Daiei, 1950. Film. Lastname, Firstname. Title of Work. Other contributors. City of publication: Publisher, Year. Print. Baum, L. Frank. The Wonderful Wizard of Oz. Introd. Regina Barreca. Illus. W. W. Denslow. New York: Signet-Penguin, 2006. Print. Denslow, W. W., illus. The Wonderful Wizard of Oz. Introd. Regina Barreca. By L. Frank Baum. Introd. Regina Barreca. New York: Signet-Penguin, 2006. Print. Title of Map. Map. Place of publication: Publisher, Year. Print. Japanese Fundamentals. Chart. Hauppauge: Barron, 1992. Print. Michigan. Map. Chicago: Rand, 2000. Print. “Western Boundaries of Brazil, 1600, 1780, and the Present.” Map. Brazillian Narrative Traditions in a Comparative Context. By Earl E. Fitz. New YorkL MLA, 2005. 43. Print. Lastname, Firstname. “Title of video.” Title of Website. Website sponsor. Date of publication. Web. Date of retrieval. Carell, Steve, and Stephen Colbert, perfs. “Daily Show: Carell – Colbert – Even Stevphen – Death Tax.” The Daily Show with Jon Stewart. Comedy Central. 19 June 2002. Web. 25 Feb. 2011. Hungrybear9562. “Yosemitebear Moubtain Giant Double Rainbow 1-8-10.” YouTube. YouTube. 8 Jan. 2010. Web. 18 Feb. 2011. Tate. “Google Films: Philippa Simpson on the Ghost of a Flea.” Art Project. Google. 10 Aug. 2010. Web. Feb. 20 2011. Title of Work. Contributors and performing company. Venue of performance, City of venue. Date of performance. Performance. Heartbreak House. By George Bernard Shaw. Dir. Robin Lefevre. Perf. Phillip Bosco and Swoosie Kurtz. Roundabout Theatre Company. Amer. Airlines Theatre, New York. 1 Oct. 2006. Performance. South African Suite. Chor. Arthur Mitchell, Augustus Van Heerder, and Laveen Naidu. Dance Theatre of Harlem. Cadillac Palace Theatre, Chicago. 1 June 2002. Performance. Culkin, Kieran, perf. Suburbia. By Eric Bogosian. Second Stage Theatre, New York. 16 Sept. 2006. Performance. “Title of Segment.” Contributors. Television program. Name of Network. Call letters of local station. Date of broadcast. Television. “The Phantom Corleone.” Narr. Steve Kroft. Sixty Minutes. CBS. WCBS, New York, 10 Dec. 2006. Television. Wells, Orson, dir. “The War of the Worlds.” By H. G. Wells. Adapt., Howard Koch. Mercury Theatre on the Air. CBS Radio. WCBS, New York, 30 Oct. 1938. Radio.